My small (1.5hp) air compressor is connected to a water trap made of 8mm copper of about 4 metres length. The idea is that you push the compressed air through the piping which cools it, condensing the water out (which you drain away) and thus sending dry air to your air tools. I know the system works, but i would like to understand the maths behind it. I started trying to work it out with help of the below graph from engineeringtoolbox.com but didn't know where to go next. 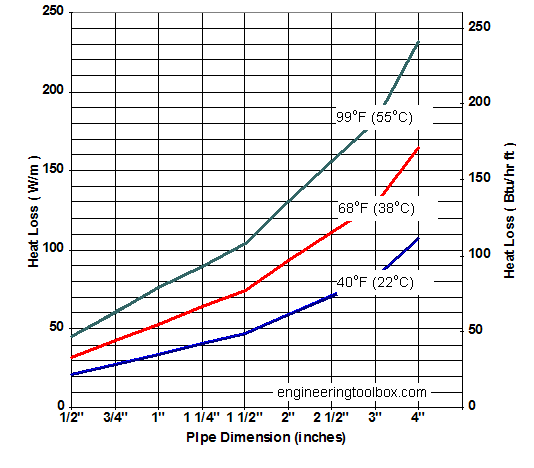 How can I mathematically determine the temperature drop of the air in the piping? We can assume an average ambient temperature of 25 degrees Celcius with air coming out of the compressor at 100 degrees Celcius. Browse other questions tagged thermodynamics fluid-dynamics or ask your own question. Why is the outside run of high presure line on a ductless mini-split airconditioner insulated? How do simple bird waterers work? How much work do I need to convert 300ml of water from 25°C to 3°C? Energy Per Dry Ice Mass Required By de Laval Expansion of Air? Why don't we burn our hands when using a garden water hose? Can you use sun light to heat an objects surface to hotter than the surface of the Sun?